Mattermark tracks several signals of growth and public interest in startup companies. On the eve of Twitter’s IPO on the New York Stock exchange, we thought it would be interesting to see how the company’s following has grown in the month’s leading up to this liquidity event. 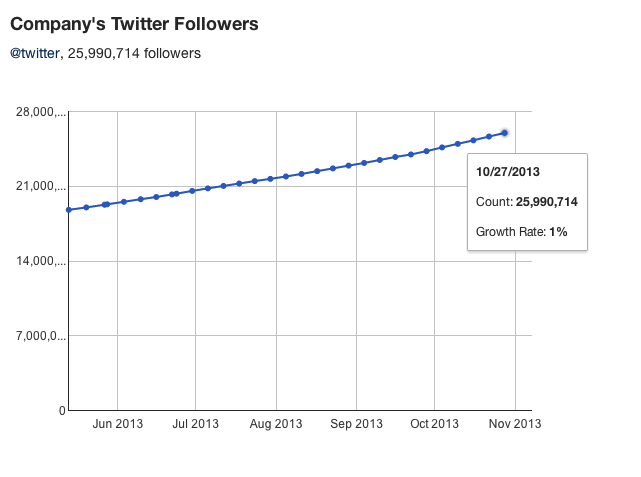 Our crawler hasn’t run for the most recent week but as of publishing Twitter’s total follower count is 26,567,552. I wonder what percentage of people going through the signup flow follow Twitter? As of tonight, I was prompted to follow @Instagram (owned by Facebook, interesting! ), @YouTube (owned by Google, interesting! ), @NihalMehta, @Zendaya and @Ciara… and then the Twitter suggests I follow “well known people” like… Twitter!